Certificate of Accreditation No. 563/2017 . Accreditation is official recognition by the accredited body to operate in the scope which is documented on an accreditation certificate and specified in the Certificate of Accreditation. 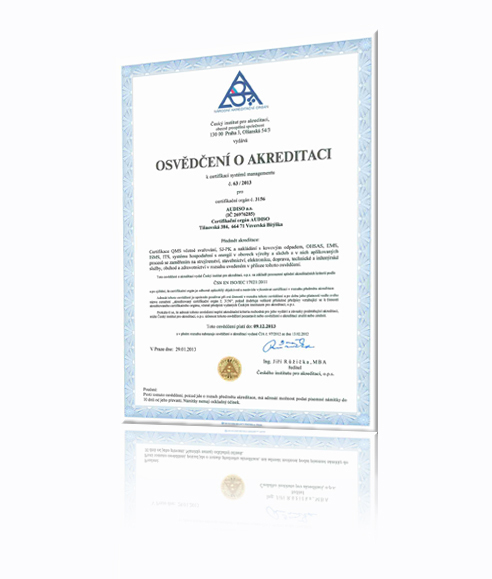 In the Czech Republic is created the accreditation system that manages the Czech Accreditation Institute (CAI ) as a national accreditation body . CAI is a full member of international organizations EA (European Co -operation for Accreditation ) , ILAC ( International Laboratory Accreditation Cooperation) IAF ( International Accreditation Forum). On the base of the positive results of international audit (the evaluation) is CAI currently signatory of the Agreement on mutual recognition of accreditation.